Flow123d is a simulator of underground water flow, solute and heat transport in fractured porous media. Novelty of this software is support of computations on complex meshes consisting of simplicial elements of different dimensions. Therefore, we can combine continuum models and discrete fracture network models. 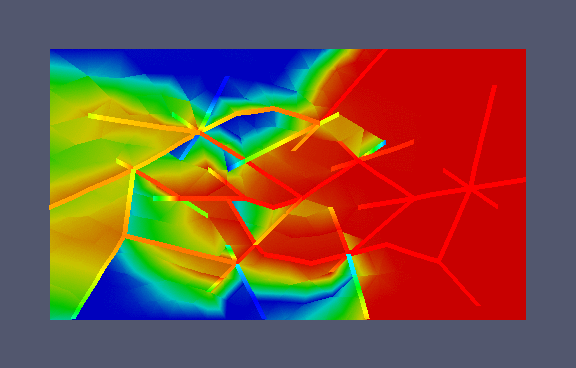 Current version includes mixed-hybrid solver for steady and unsteady Darcy flow, finite volume model and discontinuous Galerkin model for solute transport of several substances and heat transfer model. Using operator splitting, we support models for various local processes including dual porosity, sorption, decays and simple reactions. Computations can be run in parallel using MPI with scalability up to hundreds of processors. The input interface based on JSON file format allows specification of general space-time dependent data for any physical parameter that does not compromise performance. Program supports output into GMSH and VTK formats.